What does it take to be a “one percenter?” How much do you have to earn before you fall into this rarified zone? A new study, written by socioeconomists Estelle Sommeiller and Mark Price, looked at state-level tax data from the Internal Revenue Service over the past 35 years. 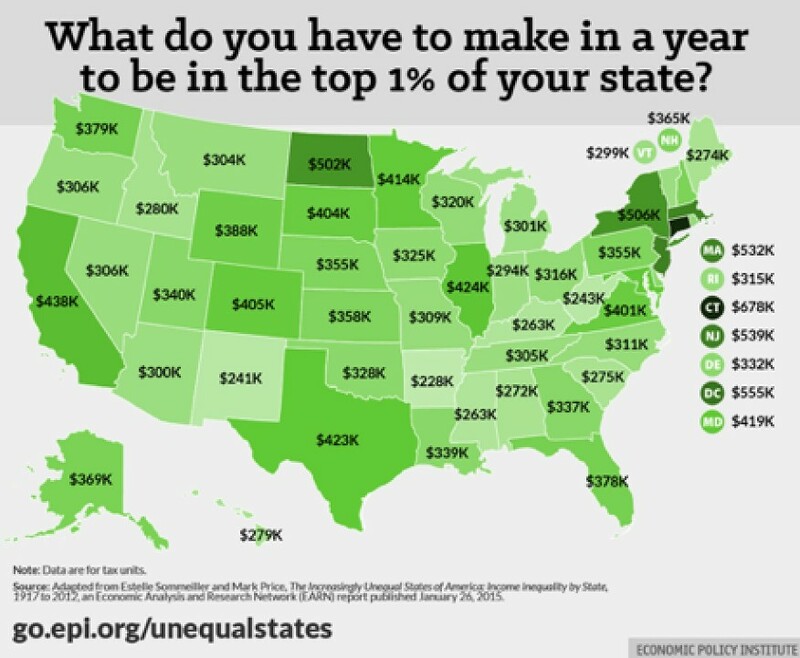 They’ve created a chart which looks at annual income at the threshold of the top 1% in each U.S. state. If you live in Connecticut, you’re a “one percenter” if you earn more than $678,000 a year, higher than New York’s threshold of $506,000, the $539,000 threshold in New Jersey, $555,000 in Washington, D.C. or $532,000 in Massachusetts. California ($438,000) and Texas ($423,000), which are considered wealthy states, actually came in behind North Dakota ($502,000). States with the lowest threshold include West Virginia ($243,000), Kentucky and Alabama ($263,000) and Maine ($274,000). If somebody earning a good income in Connecticut or New York wanted to break into the one-percent category, he or she could move to a less competitive state. Nationwide, the total share of income going to the upper 1% rose by about 12 percentage points since 1979. The one-percenters in Connecticut make a little over 33% of all income in that state, and in New York, the percentage is 32.6%. Elsewhere, the range is generally in the 14% to 22% range, up from the 7-11% range back in 1979.